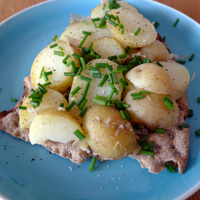 The perfect summer snack - an easy to make open crispbread sandwich. Smear the bread with butter (this is the glue that holds the other ingredients on to the bread). Put slices of cold potato on to the bread. Put egg, herring or Kalles Kaviar - if used - on top of the potato. Cut chives over the sandwich.